A short while back, I entered Waterstones and excitedly asked an assistant if she could help me find a book from my childhood without knowing the title. "It's about a girl called Alanna," I explained, "She pretends to be a boy so that she can become a knight, and is adopted by her mentor, a man called Myles." 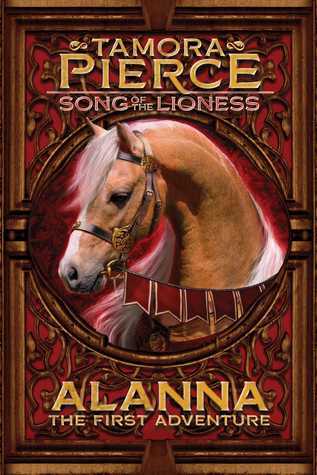 Alanna is the first in a quadrilogy following the adventures of the titled heroine. We first meet her and her twin, Thom, as they are preparing to be sent of to their appropriate schools at the age of 10: Alanna to a convent where she will learn the art of magic (and presumably, "how to be a lady"), and Thom to the palace of King Roald, where he would be trained as a knight. Neither twin appreciates the role for which they have been chosen, so the pair hatch a plan to swap places where Alanna cuts her hair to become "Alan", Thom's twin "brother". Thankfully, Alanna is able to deceive Coram, her aide, for long enough that he doesn't suspect the swap until they are well on the road to the palace. With some persuasion, Coram agrees to the deceit and supports Alanna's aim of achieving her knighthood before revealing to the entire court that she is actually a young woman. The First Adventure takes Alanna through the first couple of years of her knight's training. Her story continues in the following three books, which I read immediately after as I simply could not wait to learn how Alanna's story ends. The edition I own is a paperback version, printed much more recently than the hardback I devoured as a child and contains a highly interesting and notable section by the author, Tamora Pierce, which explains how Alanna was conceived. Originally, she had written the quadrilogy as a single novel - for an adult audience! With this knowledge in mind, reading consecutive editions I realised just how much the "adult content" had been played down for a less mature audience, though reading between the lines Pierce's original intent is still there. As an adult reader, this knowledge helped me to appreciate Song of the Lioness even more, though I suspect I'd prefer my daughter to wait until she's a little older before allowing her to read the third or fourth instalments! While The First Adventure is very tame, and contains only the mildest hint of romance, In the Hand of the Goddess begins to explore the theme in a little more detail. Alanna: the First Adventure is a coming of age tale with elements of fantasy and magic. Featuring a strong female heroine, I'd say it's a great read for girls (and boys) around age 10 or older, and certainly for adult readers who enjoy an easy-going novel in which the story is presented amazingly well. Now that I'm aware Pierce has written more series set within the same "universe", my TBR pile will be high for quite some time!